Adult dogs may experience issues with housebreaking for several reasons. Dogs who have been kept outdoors are unlikely to have housebreaking skills, and oftentimes, rescue or shelter dogs may be untrained. Housebreaking an adult dog takes patience, training and attention to schedule, but can be accomplished. Medical issues should be ruled out prior to embarking on a housebreaking routine. As humans do, dogs also experience changes as they grow older. A senior dog may appear to have housebreaking issues, when in reality, they may become incontinent as they grow older. Medical issues such as diabetes, kidney disease, and urinary tract and parasite infections may cause your dog to appear to have lost her housebreaking skills. Additionally, a change in diet can often cause gastrointestinal disorders, causing your dog to eliminate indoors, simply because she cannot make it outside to her normal bathroom area. It's important to rule out an underlying medical issue prior to beginning housebreaking training. If your dog suddenly becomes incontinent or appears to have lost her housebreaking skill set, a visit to her veterinarian is in order. 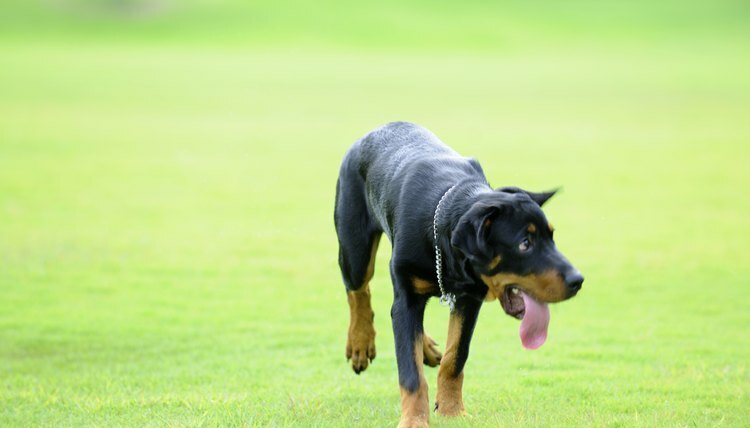 Identifying the underlying causes of the untrained adult dog will assist you to determine the course of action to help her become housebroken. A new dog introduced into the household may be trained, but may be uncertain of how to communicate to you that she needs to eliminate, or unsure of her elimination area. She may fear the outside, especially if she was kept outdoors and is a rescue dog who may have been abused or neglected. Similarly, if a family member leaves or dies, your adult dog may have issues with eliminating in the house. She may urinate in an area where this missing individual used to sit, to mark this territory as her own. All dogs, whether they are puppies or untrained adults, benefit from a regimented schedule during housebreaking training. Feed your adult dog at the same time each day, and take her outside to relieve herself immediately afterward. Praise her and offer her treats after she eliminates so that she associates this behavior with a positive response from you. Choose a specific spot in the yard for her to eliminate, and use a vocal command such as, "let's go potty." Once she's housebroken, the vocal command will have her heading to her own private doggy bathroom as if it's become second nature to her. Consider hanging a small bell on the doorknob. Your dog will associate this sound with the opportunity to eliminate outside. Eventually she may learn to ring the bell herself. If you adopt an adult dog and find that she's completely untrained, revert back to puppy basics. Dogs are unlikely to eliminate where they sleep, so consider confining your dog to a small area. The area should be large enough for her to sit, stand, turn around and lie down comfortably. Once she learns housebreaking skills, enlarge her area and give her more freedom. Be patient and consistent and expect the occasional accident. Never scold or punish a dog for having an accident in the house, as this is part of the learning process. If you catch your dog in the act of eliminating indoors, use the vocal command and lead her outside to her designated elimination area. Why Is My Dog Aggressive Toward Men?